We are in full-throttle Wedding Frenzy at the Curmudgeon home these days. As of today, only 11 days remain until I walk Older Daughter down the aisle. Older Daughter is a tad tense these days. Tense? When the weather was more humid, you could see the waves of tension preceding her, even before she came into the room. And she and her fiance are arguing over... well... over everything at this point. But some of these disagreements would be expected of almost any young couple on the brink of matrimony... and Older Daughter, with her heightened sense of drama, would be expected to have more than her share. The one bit of advice that Long Suffering Spouse and I have tried to impart is that -- however much Older Daughter may think otherwise -- the Day itself is not very important. It's all the days that follow that matter. Which brings me to Youngest Son. Youngest Son has a friend. This young man -- we'll call him George -- has been on Youngest Son's baseball teams the past three years. We've met George's father; he comes to most of the games. Long Suffering Spouse and I could not remember seeing George's mother. Turns out, there was a reason. Youngest Son has seen the tension in our household caused by Older Daughter's pending nuptials. He's also seen the tension in both of George's households resulting from the divorce. I don't think he believes the two are comparable. A week or two ago Youngest Son told us about another teammate, Herman, whose parents were contemplating separation and divorce. I guess the separation was quickly implemented after Mr. Herman took a swing at Mrs. Herman and Youngest Son's friend Herman intervened to protect his mother. By high school, with weight training and so forth, athletic kids can intervene fairly effectively. Anyway, Youngest Son has told us about these troubles with George and Herman and one day recently he summed it all up. "Mom, Dad," he said, "don't get divorced." Barb, our guru, who created Heads or Tails without using any hand tools whatsoever, with the arguable exceptions of a keyboard and a mouse, asks us to write today about "tools." In HoT 66, I wrote about my disastrous experiences in junior high shop class, a subject I'd alluded to in an earlier post wherein I confessed that I don't particularly like to hang out in hardware stores. So I've beaten that subject to death... or, more to the point, hammered it home already. So, without further preface, I'll write about the most important tool of the lawyer's trade. I am not referring to lawsuits. Although, as has been oft observed, when the only tool on your belt is a hammer, you may try and make all of your problems into some kind of nail. This observation segues nicely into the short, short (but sufficient unto itself) course in legal ethics, taught me by my late father (also a lawyer). He asked me once if I thought a carpenter's most important tool was a hammer. Long Suffering Spouse and I had actually made it to the end of a late movie on the TV without either of us falling asleep Saturday night. Laugh if you must, but for us, this is an achievement. At the time we also thought it remarkable that Youngest Son and Younger Daughter had both retired upstairs before us. We weren't waiting up for anyone else. Middle Son was off to a concert and staying with friends; Older Daughter was in Indianapolis tormenting her fiance and his family with her Wedding Frenzy. I climbed into bed, ready to surrender happily into the arms of Morpheus... and then I heard voices. I thought at first it might be conversation in the street outside the house. Ours is a quiet residential street, but nocturnals do sometimes gather for various purposes across the street, where there is something of a parking lot, and an old folks home. Then I realized the air conditioner was on and the windows were closed. If it was neighborhood nocturnals, I should not have been able to hear them. I got up to investigate, eventually locating the noise behind the closed door of Younger Daughter's bedroom. Perhaps she was talking in her sleep. I knocked. "Are you alright in there?" "I'm on the phone, Dad." A little louder for my benefit. "I'm on the phone, Dad." "Well, it's nearly 2:00am and the phone needs to sleep, even if you don't. Hang up." Yesterday afternoon, after Mass, I asked her what was so important that had to be discussed at 2:00am. Where I come from, phones ringing in the middle of the night are always bad news. Someone has been arrested; someone has been injured; someone has died. But the nocturnals are different, apparently, in this as in so many other things. I got no satisfactory answer from Younger Daughter, but Long Suffering Spouse persisted and told me later that Younger Daughter had received not one but several calls in the wee hours: Several of her friends who were out for the evening 'checked in' with her upon their return. What the heck was so important it couldn't wait for daylight? When we finally broke down and let the high school kids get cell phones (Younger Daughter is in college now, but she got hers in high school) Long Suffering Spouse and I said we would collect the phones at night before we retired. They could have them back in the morning. Just as we didn't want anyone calling the landline after 10:00pm, we didn't want kids getting their sleep disturbed by midnight calls on their cells. This practice may have lasted a week. Soon, the kids realized that they had merely to outlast us and thus keep their phones 24/7: Long Suffering Spouse and I would fall asleep watching the History Channel and they'd sneak off to their rooms (or be up there the whole night anyway, allegedly doing homework) and then they'd have beaten us. It wouldn't make sense for us to interrupt the kids' sleep by demanding their cell phones when the purpose of demanding the phones was to keep said phones from interrupting their sleep, would it? And this is where logic has taken us. Media frenzy. Troubling questions. Happy Friday. I can understand the hysteria in southern California, where celebrity-worship is the predominant activity, but I was ill-prepared (though, on reflection, I should have known better) for the near-hysteria from the Chicago TV stations, all doing stand-ups live from nearby Gary, at the little house where Michael and all the other Jacksons were launched. Oh! the grieving fans! It's amazing how a fleet of TV trucks and lights will attract a crowd of mourners. Isn't Congress busy passing some sort of energy tax? Maybe, if I had a functioning brain cell left in my cranium, I'd probably be studying up on that... not that my opinion will matter one whit in the pre-determined outcome. Are people still getting themselves killed in the streets of Tehran, fighting for the freedom we so carelessly squander on trivial things? Actually, I haven't quite figured out whether this means that things aren't as bad as we sometimes think... or whether it really means that things have always been this bad and we should get over it already. I've been in a mediation for over eight hours so, at this point, I don't know if I can figure anything out at all. I have a new anxiety dream. This is, I understand, not exactly earth-shattering news. However, after a half-century on this planet, it struck me as a significant step forward that I was no longer the Student Unprepared For A Final in my latest anxiety dream; this time, I was the Teacher Who Failed to Prepare A Final. That must be progress of a sort, right? You may ask, of course, don't I have anxiety dreams about my law practice? I suppose that would make sense -- but, oddly enough, I don't. It's probably because I try not to think about my law practice, even on a subconscious level. I didn't grow up in the 80s and I will never read even one celebrity health-and-beauty book. 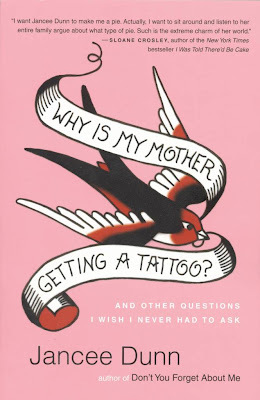 I admit, therefore, that I am probably not in the target demographic for Jancee Dunn's very funny, enjoyable new book, Why Is My Mother Getting a Tattoo? In fact, before being asked to read and review the book, I'd never heard of Ms. Dunn. And, looking at Ms. Dunn's bio, this should have come as no surprise: Dunn was once a veejay on MTV2; I never even watched MTV1. According to Wikipedia, Ms. Dunn was a writer for Rolling Stone between 1989 and 2003. I haven't picked up a copy of Rolling Stone since around the time that Dr. Hook & The Medicine Show were making a musical pitch to be on the cover. Dunn has also written for GQ. Insert your own obvious joke here. Tattoo is mostly a collection of essays about Dunn's very close, loving family and, in particular, about the growing realization that her parents will at some point no longer be available to provide the clan's focal point. But that makes the book sound syrupy... or sad. It is neither. These are just good-natured stories told by a good storyteller. I suppose you could liken Tattoo to a collection of long-form blog posts, posts that you can take to read on the bus or the train going home without a wireless network card. At least one chapter, "His 'n' Hers Tiger-Print Underwear in Soft, Shape-Retaining Fabric," appears to have grown out of a 2007 post on Jancee's blog. As an anonymous blogger worried that my occasional stories about friends and family might offend, I found it fascinating that Jancee's family and friends were so willing to have their lives opened up to public scrutiny. Enlisting the aid of Ms. Dunn's publicist, I inquired as to how Jancee secured their cooperation. The author responded, by email, that she's "gradually worn them down." Her first book, But Enough About Me: A Jersey Girl's Unlikely Adventures Among the Absurdly Famous, was a memoir, she told me, and her parents "balked a lot more" while she was writing that one. When that book appeared, Dunn said, her parents found "that they sort of like the attention." Dunn said her parents "haven't had to draw too many boundaries because I respect them too much to delve into any serious dirty laundry. Not that I'm hiding much. My father really was a boy scout, a church acolyte, a crossing guard, his high school's designated driver. I simply don't have any decently sleazy material. In fact when I wrote the memoir, I fretted that I didn't have a dysfunctional family." The respect that Dunn has for her family, and particularly for her parents, comes through loud and clear in Tattoo. But I was still not satisfied. I wanted to know how Jancee's parents would answer the question of why they've agreed to have their lives opened up in this way. Ms. Dunn agreed to ask. Jancee's mother, as you'll learn in Tattoo, is a former beauty queen. She may be the mother of three Jersey girls, but she has retained her own Southern roots. Jancee's father is a long-time employee of J.C. Penney, now retired. When he and Jancee's mother decided to sell the home in which they raised their children, he thought it would be a good idea to make a video farewell tour of the place. Unfortunately, so far as his children were concerned, he didn't take the video until everything was moved out. He couldn't understand why the kids thought that was a bad idea. Mom: It wasn't hard at all to persuade her not to include things I didn't want in the book, because we don't talk about really, really personal problems outside the family. In which case, we just said "Jancee, this is off the record." But it really doesn't matter what else she writes about, because our life is kind of an open book anyhow. And we get a kick out of reading her stuff. Dad: I just tell her not to say anything. I am the father, you know. Though I was not familiar with Dunn before reading Why Is My Mother Getting a Tattoo? I feel like I know Jancee and her whole family now. And thus we see another benefit of anonymous blogging: The Dunn family can't quite figure out, yet, what name to put on the restraining order. Why Is My Mother Getting a Tattoo? is available today online and in bookstores. Full Disclosure Department: I received a free copy of the book, and was solicited for a review, by Liza Lucas of Goldberg McDuffie Communications. In today's Heads or Tails, blogging's own midsummer night's dream, Barb, asks us to recount a specific summer memory. Back when I was single, there was a great party I went to one summer on the Michigan side of Lake Michigan... and a beautiful beach... and a very friendly young lady.... Of course, my account of those memories might be inappropriate for younger or more sensitive readers -- and you wouldn't believe me anyway. Barb picked this topic last year as well. Last year I wrote about an incident that occurred when I was working as a laborer after my first year of law school. Today, I'll revisit that same job. You wouldn't know it from my paunchy appearance these days, but as a 21-year old law student I was skinny as a rail. I looked as much like a praying mantis with sideburns and bags under my eyes as anything else. That's why I thought it funny when my father told me he'd set me up for a summer job with a general contractor that he knew. The contractor was building a subdivision within easy biking distance of my parents' home out where Christ lost His shoes. The contractor was a dark, Italian-American man about 5'6" and built like a barrel. "Kid, we're going to turn you into coiled steel this summer," he told me. "Coiled steel." He had trouble saying that with a straight face -- and I sure couldn't blame him. I may have seen the actual contractor twice more that entire summer. The guy I reported to every day was the foreman. I'll call him Burt. This was a small subdivision. No homes were built on spec; each new house was under contract before ground was broken. 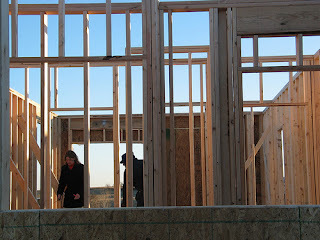 I was one of three laborers on the site; the others were Mexicans. Whatever time I got there in the morning -- and it was early -- the two Mexicans were there before me. They kept working after I was free to go. I eventually learned that they were sleeping on the site. Looking back, I guess they must have been illegals. At the time all I knew was that they worked longer and harder on their worst day than I could on my best. Most of the work I did involved sweeping here or toting supplies there. One of my regular duties involved pumping basements. Before each new house was enclosed, its basement would fill with water whenever it rained. Depending on where the water table was, the basement might have filled with water anyway. This is why sump pumps were invented. The bricklayers weren't the only tradesmen to drink at lunch. I accepted the plumber's invitation to lunch one day. He drove us to a joint off the site. I let him buy me a beer... but I wasn't going to let him buy me two. Something in his manner or tone... well, I was glad to get back to work. Even with the bricklayers. Another time I brought insulation to the carpenters. The youngest of them asked me if I was from the area. Yes, I said. He asked if I had gone to the local high school. Yes, I said. "How many years?" he asked. Burt certainly didn't need a "college boy" to fetch insulation or pump basements. But I had a vital function in the continued smooth operation of the development. You'll remember I mentioned that ground was not broken for a house unless it was under contract? The new home buyers -- young couples, maybe with a kid or two -- generally moving up from an apartment or condo -- didn't realize that the scheduled completion date that was in the sales documents was not as firm as it had seemed to be on paper. So people lost their leases. They were reduced to living with one of their parents. Or in their cars. With their furniture in increasingly expensive storage. And they were angry, angry young couples that came to confront ol' Burt every couple of days. I don't recall seeing any of them carrying ropes or torches or pitchforks... but they had the attitude of persons who might carry such things as they stalked around the site looking for Burt. And it was here that I earned my keep. That's when Burt would motion me over. "Bill, Sally," he'd twang, just as if they'd been discussing baseball and not threatening to tear him limb from limb, "have you met our young Curmudgeon? C'mon over here, Curmudgeon, and meet Bill and Sally." Then Burt would turn back to Bill and Sally and tell them, in a conversational, even conspiratorial, tone, "Curmudgeon here is a college boy. He's going to law school." Then he'd turn toward me -- and I'd better be there -- "Aren't you, Curmudgeon?" My job at this point was to have my hand extended. Yes, Burt would direct me, shake hands with Bill and Sally (or Ted and Jane or Ed and Edna; this happened more than once). These same people, who moments ago had blood in their eyes and murder in their hearts, would weakly shake my hand. Often we'd engage in some rather forced small talk about school. After all, I wasn't the one they had come to confront. And so the moment of danger would pass: These angry people weren't hardened killers, they were just frustrated, but fundamentally nice, people who were sick of living in their car. So having exchanged conversational niceties with yours truly, they weren't immediately able to recapture their homicidal rage. Burt could then placate them with promises that the house would be done in just one more week or 10 more days. Thirty-some years out I am more convinced than ever that this was my only real value to the project: I was a human lightning rod. I mentioned Friday that Long Suffering Spouse's college roommate, Penny, was coming to visit. She and her husband, Carl, who retired a couple of years back as a major in the Marine Corps, have four adopted children, 17, 13, and a pair of two-year old twins, Tim and Tom, who came to Penny and Carl as critically ill preemies. Carl and I were sitting in the living room, sipping stimulating beverages, watching as Tom poked around everything. Tom couldn't quite reach the face of the fan, but he could feel the breeze and he tried poking at the blades with his fingers. I never really thought he'd actually get his fingers through the protective covering and into the whirling blades -- but stranger things have happened and, as he, I and the fan were on the same side of the living room, I took it upon myself to discourage him. "No," I told him, "you mustn't touch," and I gently moved his hand away. So far... so good, right? My attempts to discourage Tom from pressing the buttons, failed spectacularly: Tom kept pressing buttons with increasing enthusiasm. Ultimately Carl was forced to launch a diversionary maneuver. As I recall, he used blocks. Afterward, I asked Carl where I had gone wrong. "You did nothing terrible," said Carl, "you explained to him quite calmly and logically why it was a bad idea to press those buttons. Of course, you also showed him exactly how to press those buttons as you did so." Who says science can't provide solace? I had such grand plans for this morning's post... I wanted to write about the "revelation" that former Chicago Cub great Sammy So-so, er, Sosa was another of the 104 ballplayers who had positive PED results in that "confidential" 2003 test. But such a week it's been... wedding preparations ramping up, Older Daughter melting down... and, meanwhile, I was busy committing professional suicide. Well, maybe committing professional suicide. I hope not. And, today, Long Suffering Spouse's college roommate, whom I've introduced here as Penny, will be visiting with her husband and three of her four children. They live in Virginia now, but they were in the Midwest for a wedding of one of Penny's nieces. And two of Penny's children are toddlers -- twins she and her husband adopted as preemies. That's a wonderful story... but the immediate problem for Long Suffering Spouse is that our home hasn't been 'toddler-proofed' since about 1994. And Long Suffering Spouse just called to say that our electric is out at home. The lightning storms that woke us up at 3:30 today were apparently mild in comparison to what's roiling over the Curmudgeon home at present. So, today, instead of a coherent (at least in my own mind) slice-of-life blogpost, there is only this rambling programming note. You'll forgive me now, but I really need to get working on a brief that was due Monday but didn't get written because I was committing professional suicide. Or not. OK, we have to wrap this up: I don't think there's anyone in America that doesn't agree that the health care system is in serious need of reform. I also think most people would agree that, when it works, our health care system is the best in the world. It just doesn't work that way for many. The goal of reformers, therefore, should be to preserve the quality of care that is available in America to some... and make it more available to more people. I don't believe that government can achieve this goal by providing health insurance or health care itself. Government provided health care sounds like eternity in line at the DMV, only with people coughing, hacking and sometimes passing out. On the other hand, sitting back and wishing for the "market" to work all by itself is foolish, too. First, right now, there is no real easy-to-define "market" for health insurance and health care. Some people provide their health insurance, as I did for many years. But most people don't see or feel what it really costs for health care: Either their employer provides it (O! You dwindling few!)... or the State provides it (Medicaid and Medicare)... or the Bankruptcy Court dismisses it (for those uninsured who guessed wrong about the state of their health). There are (to borrow a recent, but still hackneyed phrase) 'green shoots' of a market in phenomena such as nurse practitioners beginning to staff 'clinics' in pharmacy chain stores. Sound government policy, I'd submit, would be to wean Americans off the employer-provided system and introduce an individual-based one. Now I've railed here against some of the horrible companies I've seen providing individual coverage: Thieves and liars are some of the nicest things I've called some of them. So it may seem strange for me to suggest that this can be a model for us to follow. But this is where government can play a constructive, useful role. Government can be a nifty referee, prescribing mandatory rules for coverage and providing a level playing field for consumers and holding insurers accountable for misconduct through -- are you ready for it? -- the court system. Government can insist on uniform standards for all health insurance policies: All policies must cover preexisting conditions, for example, or insure over genetic tendencies. Prohibit health insurers from 'negotiating' prices for services: Make doctors and hospitals charge what they need and compete with other hospitals and doctors on cost and/or quality of care. And let's take Medicare and Medicaid out of negotiating prices, too. If a hospital wants to charge $3,000 to Blue Cross for an overnight stay, it can't charge $3,500 to Aetna -- or $10,000 to an uninsured person. But what would keep doctors and hospitals from jacking prices through the stratosphere? Shame alone won't work. We seem to live in a post-shame world. But we can require (regulation) that non-profit hospitals must truly be non-profit, or forfeit that status. And we can permit health insurers hire their own doctors and run their own hospitals. The new Blue Cross might be able to pay (say) 75% of any insured's hospitalization at any place the insured chooses -- but 85% of the hospitalization if the surgery is done at the Blue Cross owned hospital. Here again, government could set the upper and lower percentages and thereby be helpful. That's appropriate regulation. Within this regulatory framework, people could make decisions appropriate to their own circumstances and prices would be controlled. Even if uniform health insurance standards were prescribed at the national level, I'd like to see health insurance contracts enforceable in the state courts -- and no diversity removals, either. Let local communities decide, in jury trials, whether one of their neighbors has tried to cheat the insurer... or vice versa. The meaningful threat of an attorney fee award can be a significant deterrent to an insurer that might be tempted to boost profits by failing to provide contracted coverage. Encourage the formation of doctor-owned malpractice carriers... even tort lawyer-owned malpractice carriers. But prohibit malpractice insurers and health insurers from being jointly owned. That's useful regulation. Health insurers that run hospitals or hire doctors would be subject to the same malpractice risks as any other hospital or employer of physicians. Don't cap malpractice recoveries but, rather, insist that malpractice insurers have the right and duty to settle cases where settlement is indicated. Don't brand doctors with the Mark of Cain because of a malpractice settlement -- but beef up state medical boards to weed out incompetent doctors. Regulation, again. Some people will surely be unable to provide coverage for themselves or their families, no matter what price the policy. Government will in effect be picking up the tab for these people whether it is through charity hospitals (e.g., Cook County Hospital) or by setting up its own clinics and hospitals or by paying for services obtained. I'm willing to bet, however, that -- government being as incompetent in most things as it is -- most people, if they have a meaningful, reasonably-priced alternative, will choose anything other than government health care every time. I've been trying for three days now to think of an analogy to show what I think government can and can not do. This is the best I've come up with. I know some lawyers, both plaintiff and defense lawyers, who know more medicine than most doctors. They can diagnose and evaluate with the best doctor you could find. That's how they can evaluate cases, taking good ones, or settling bad ones. Yet, I wouldn't let one of those lawyers near me for treatment, not even with a 10 foot thermometer. Just because a lawyer has extensive medical knowledge does not make him or her a doctor. In a way similar to my lawyer acquaintances, government can develop expertise in regulating health insurance and health care -- especially if it permits the nation's lawyers to keep the players honest -- but government can't provide health care. As we are about, I am afraid, to find out. Chicago Sun-Times. Click to enlarge. Sometimes, no additional explanation is needed. Some in the audience at the AMA convention booed President Obama yesterday when he said he would not favor "caps" on medical malpractice cases -- contrary to my fearless prediction here yesterday morning -- but there were cheers when he indicated he was open to other reforms. I'm all for reforms that will make things better. One thing we need to do is to call a truce in the war between doctors and lawyers -- especially over medical malpractice cases. If there's a doctor in the house, swallow your bile and read on as I explain why the malpractice crisis is no more real than the monster in your kid's closet. It is a fact that, in the universe of cases filed, there are relatively few malpractice cases. The extraordinary verdicts in some of these are usually in cases where the doctor is incredibly, embarrassingly guilty. Oh, huge malpractice premiums are real enough. Premiums are so staggeringly high that they can, and sometimes do, drive good doctors from vital specialties -- such as obstetrics. And, if you'll pick up any random edition of the Cook County Jury Verdict Reporter, you'll usually see a large number of medical malpractice cases represented. But that's not because so many of these are filed -- it's because a disproportionately high number of these kinds of cases go to trial vis a vis other types of cases. In Illinois, these kinds of cases go to trial because doctors have traditionally had veto power over any settlement. That's not the way it works with an auto liability policy. A person sued for allegedly running a red light and smashing into another car has no say in whether his insurer settles -- even though he may insist, loud and long, that he did not run that light, that it was not his fault. The insurer makes an economic decision; sometimes it may even believe its insured -- and still settle the case, if the price is right, because it considers its costs through trial and the risks of receiving an adverse verdict. But no matter how clear-cut the case against Dr. No may be, Dr. No may be able to insist on a trial -- and that seemingly outrageous verdict which follows may be the result of a justifiably outraged jury. Caps are the wrong way to contain these rare cases; the better way would be to allow insurers the right to settle cases when settlement is appropriate. And even with those occasional guilty (and stubborn) as-all-get-out cases, in the plaintiff-friendly, overly generous, "judicial hellhole" of Cook County, doctors win more malpractice cases than they lose. Why are there so few attorneys who I believe capable of handling a med mal case? It's not just that malpractice cases are difficult (although they are) but most attorneys simply can not handle the cost of carrying even one malpractice case to trial. Nor is every incident of arguable medical malpractice a case that lawyer would or should take. Let me illustrate with an example in my own family, that I first wrote about in 2005. Older Daughter developed some serious foot problems while she was in college and these had to be treated with surgery. The first surgery did not go well. [In that first surgery] a nerve was severed that should not have been. It has caused my daughter pain and discomfort since. A subsequent operation, by a different doctor, in which the nerve was 'tucked into' the muscle, has failed to resolve the problem. Now the second doctor has sent her to a third doctor, who proposes still other surgery. [I] pointed out that, although she continues to have pain, especially if she's too long on her feet, she may not have been injured badly enough to make it economically worthwhile to pursue a case for malpractice, given the costs and uncertainties of such a claim, even if a lawyer specializing in malpractice cases agrees with her unkind assessment of her first doctor. She didn't want to hear that from me. She thought I must be a very bad lawyer to tell her these things. She wanted a second opinion. Eventually, worn down, I referred her to a prominent, very successful attorney in Champaign (who also clerked for me many years ago before joining his brother's successful practice Downstate). Older Daughter went to meet with him; he was sympathetic. However, he told her, he did not handle malpractice cases in Champaign because of the expense involved. He would refer her to another attorney who would evaluate her case. Guess what? My ex-clerk sent Older Daughter to one of the 10 or 12 lawyers -- in Chicago -- that I would consider capable of handling such a case. This particular fellow was not one of the ones that I know personally. And the punch line? This attorney reviewed all the records (I was pressed into service delivering them) and consulted with his own doctors (all the best malpractice attorneys have a stable of doctors with whom they can discuss the merits of a possible case; in fact, to even file a case in Illinois, a lawyer must have an affidavit from a doctor in the appropriate specialty attesting to the potential merit of the suit). After all this, he gave Older Daughter the news: Despite the severing of the nerve, it was at least arguable that the doctor complied with the standard of care -- and besides that, even if the case had real merit, the injury involved was insufficient to justify the expenses involved in bringing the case. Hmmmmm. Where had I heard that before? I suppose Older Daughter could have found someone to file her suit. Some malpractice cases clearly are filed by attorneys who shouldn't be handling them. But those aren't the cases that result in boxcar verdicts. Anyway, I firmly believe that doctors AND lawyers will have a part to play in real health care reform. Now that we've reached a truce on this malpractice business, let's move on to real reform tomorrow, OK? Mr. Obama will speak today to the meeting of the American Medical Association in Chicago. He will tell the doctors that health care "reform" is a priority and can not be delayed. What shape those reforms might take is still... largely under wraps. The President's supporters hope, and the doctors fear, that whatever program is put forward will make the government a player in the health insurance business. The unquestioned goal among many Obama supporters is to make government the only player. Many doctors fear anything that will jeopardize their income and status, yes, but many also fear that an increased government role in health care will deprive them of the right to choose what they believe best for their patients. Government health care may mean the loss of professional judgment and freedom. So Mr. Obama is expected to wave a carrot at the recalcitrant doctors today: He is expected to express an openness to liability limits on medical malpractice claims. Caps. So many doctors want caps so badly that they would give up almost anything -- including their professional freedom -- to attain them. It is apparent that the days of employer-provided health insurance are numbered. An employer-provided option may exist, on paper, in the bill that emerges from the low-profile meetings now ongoing among usually high-profile congresspeople, academics, and lobbyists. But, if such an option does make it into the language of the bill, it will be largely a chimera. The biggest employers in this country don't want to provide health insurance (e.g. Walmart)... or can't afford to anymore: The decline of the American auto makers has been blamed on health costs as much as anything else. So Big Business has finally been converted to the cause of government-provided health insurance; the Left has always has been in favor of it. I've said it here before... the skids are greased. There may be an alternative. Now, I'm not a great fan of individual health policies: I've paid for far too many over the years. When my Long Suffering Spouse began teaching full time in the Chicago Catholic schools, I got a big raise: I no longer had to shell out what was, by then, nearly $18,000 a year in health insurance payments. As an insurance lawyer, I've seen horrible examples of private health carriers screwing individuals for having the temerity to become ill during the policy term, even suing to rescind health coverage. And, personally, as one who's had a brush with cancer, I greatly fear my own ability to procure individual insurance -- at any price -- in a tooth, fang and claw free market system. But... I've also seen Medicare liens that included amounts for services provided that never were provided. Out and out fraud... in $10 increments... but multiplied over a whole flock of old people... a gold mine for the unscrupulous. Older Daughter worked in a hospital based medical practice for a year, one of six people who did nothing more than code bills for insurance payments. Why the elaborate codes? Because Medicare is already driving the health insurance market, and does so more with each passing, Baby-Boomer-aging year. Old people may not make up a majority of the population... but they consume a disproportionate share of medical services. Mr. Obama, is right, at least to this extent: Reform is badly needed and badly overdue. But government can not even take proper care of its soldiers, sailors and marines who have been injured in our recent adventures in Afghanistan and Iraq. Think of the recent scandal at Walter Reed... the jewel of the military medical system. There are far too many other examples for our purpose this morning. But both the Left and the Right misunderstand the proper role of government in health care reform. For the Left, single-payer is the only way to go -- no matter its flaws and inequities elsewhere in the world. And since government will be running the show, we can even cap malpractice claims... because, after all, our barefoot doctors laboring for the President would never make mistakes. But those on the Right, with their slavish devotion to the Market, the Market, the Market, are no better. These people are the geniuses who gave us credit default swaps. For the Left, the government must be a Player. For the Right, the government must be a Bystander. Does no one think the government might best serve as a referee? That's the role of government in an individual option that I want to talk about in a future post. Perhaps -- work permitting -- as soon as tomorrow. Looking back, I guess I was pretty hard on the other parents. But, as I tried to get across at the time, these weren't bad people, they were just not sports parents. They had to learn how to step back and let the kids develop on their own. I had to learn too. It's just that, by the time we got to the Raptors, I'd been through all this before; for the most part, these parents had not. Their kids were the oldest in their families. And the parents tried to be properly supportive. One very generous gesture was made, during the course of that season, by three or four of the families that lived very close to each other. They decided to combine resources and host a garage sale -- and donate the proceeds to the team. All the team kids were asked to come 'work' the sale, wearing their uniform jerseys. The sale was a big success. Unhappily, for me, the sale made exactly $2 more than I thought it should have made. That $2 was the amount spent by Youngest Son to buy a derelict 10" black and white TV. This TV was promptly installed in the boy's room, where it has remained... until today. I never let any of the other kids have a TV set in their rooms. Of course, none of the others had ever bought a set before. I protested, I grumbled, I fulminated even, but, in the end, I backed off. I agreed that it was his and, therefore, he could do with it as he wanted -- as long as he got his homework done, etc., etc. I, at least, have upheld my side of the bargain. That TV set has been Youngest Son's all-too-constant companion. It never did get all of the broadcast channels, but it got enough that he was able to watch innumerable reruns of "Law and Order" and "House" and awful sitcoms that killed their start-up networks. On a number of occasions I have had to venture into Youngest Son's room in the middle of the night to turn off the TV; he'd fallen asleep watching it, just as I had, watching TV in the family room. It has occurred to me, lately, that these incidents have increased in frequency. A couple of nights ago, when I got up at 3:30 in response to Nature's call, I saw once more the ghostly light coming from the gap in Youngest Son's mostly closed door. And I finally realized what was going on. Today is the day that American broadcast TV stations change signals. Analog TV sets will no longer bring in anything other than white noise. I had already had the discussion with Youngest Son about the fate of his $2 TV. I am not going to spend $50 or $60 to buy a converter for that thing, I told him. He reluctantly accepted the logic of this position (a major victory for me when a teenager sees the logic in anything). As I gingerly stepped over the piled clothes and shoes and who-knows-what-else on that kid's floor, I realized: Youngest Son is saying good-bye to a friend. We got a letter awhile back from the gas company saying that they had to come by and inspect our meter on the inside of the house, that we had to call to make an appointment, and -- if we failed to respond -- our gas service would be cut off. Perhaps the stern tone was taken because this was not the first such letter; I don't really know. These days, nearly all mail addressed to the Curmudgeon household falls into two groups: bills and stuff to be shredded. Come to think of it, it's a wonder that we did open this letter from the gas company. Anyway, imminent termination of service or not, Long Suffering Spouse was not making appointments for anyone to come by the house while she was still teaching school... unless, of course, I was willing to take the day. School ended last Friday; the appointment was duly made for this morning. "The gas man came and he's outside now, waiting." "For his supervisor. This kid [we are getting to the point, now, where just about everyone is a kid] thinks there's a gas leak." "So he's outside so he doesn't get blown up?" "Apparently. He said he has to wait outside, it's the company rule." "But you can stay inside?" "Wow, their worker's comp rates must be horrific." "I was almost afraid to call your cell phone lest it set off an explosion." Come on. You've seen the signs at the gas stations, too, haven't you? "The supervisor and the kid." "Yeah," said Long Suffering Spouse and there was some noise in the background. "I'll call you back." No, the house didn't blow up! Honestly, you think that just because this is an anonymous blog I can just make stuff up like that? The distraction was only the gas company employees emerging from the basement, pronouncing that the new doohickey that they needed to install had in fact been installed... and that there didn't seem to be a gas leak after all. But I'm still stuck on the fact that the kid from the gas company had to wait outside, while the potential victims of a gas explosion, er, residents of the household were permitted to remain therein. I guess it's a good thing we don't smoke, eh? I dropped in to 'visit' Landgirl's blog, Home in the Highlands, this morning and read that she's preparing to receive actual flesh and blood visitors from America. Landgirl, though a native Midwesterner, now lives about as far north in Scotland as one can without drowning. She's passed beyond mere gardening; she's become a farmer. I got gardening out of my system very early in life. For awhile, though, I really wanted to grow pumpkins. My folks would have a jack-o'-lantern at Halloween -- no one had the elaborate lights and special effects displays in the 1960s that are so common now -- and we would carefully save some of the seeds for planting in the Spring. We lived on the South Side of Chicago then. I'm pretty certain that, by the time I went through my pumpkin-planting phase, my father had installed a flagstone patio between the backyard's one maple tree and the chain link fence that marked the boundary with the alley. He put up a basketball hoop next to the garage, on the north side of the patio... but, oddly enough, I never learned to dribble well on a flagstone patio. Anyway, there was space between the end of the patio, on the east end of the yard, and the fence, where the pumpkins could be planted. And so we did. If vines were the sole criteria, I would have been a very successful junior pumpkin farmer. We got vines aplenty, and they'd climb the fence, too -- a good idea for cucumbers, perhaps, but a bad survival strategy for pumpkins. Most of those years (looking back, it feels like there were several, but I realize it couldn't have been more than two or three) I also got lots of beautiful orange flowers. Pumpkins start as little green swellings beneath some of the dying flowers. There was a botany lesson in all this about male and female, I suppose, but it went over my head entirely. Some of the little green swellings grew into dark green proto-pumpkins... but that's as far as I ever got. Not once did I get a full-fledged pumpkin -- sincere or otherwise -- out of that little patch. I watered too much... or too little. We had too much sun... or too much shade. Frost came early. I know that one time kids came by and smashed the biggest of the proto-pumpkins. Now my wife is a fabulous gardener. She enjoys rooting about in the dirt and she succeeds admirably with almost anything she plants. Seeds actually sprout before they leave her hands. She has one blot on her near-perfect gardening record. For a few more years in the late 90s -- over 30 years after my failed juvenile efforts -- my Long Suffering Spouse tried to grow pumpkins. My negative karma... or hostile aura... or whatever... doomed these efforts to failure. I know pumpkins are real. We sold them by the truckload for the Cub Scouts back in the day; we've bought one or more for the house nearly every year. But I have come to believe that pumpkins do not actually grow in the ground; they are probably manufactured in a Chinese factory like pretty near everything else these days. Is there no one I can feel smug about and superior to? We're all sadly used to inconsistent food peril stories: "Coffee is bad for you!" -- "Coffee is OK, but tea is terrible!" -- "No, wait, scientists were right the first time... coffee's bad" -- "Scientists prove that coffee better for you than oxygen." Now, I guess, as the linked story portends, we are going to be showered with inconsistent statements about what's best for the environment. The problem is that I can measure my actual footprint with a ruler. Measuring my true carbon footprint, though, necessarily requires some interpretation. Here's my suggestion: According to the newspapers, whatever you eat will surely kill you. On the other hand, eating nothing will also kill you. So... eat what you want. If it make you feel bad, don't eat it anymore. Let's take the same approach with these "green" stories: Use a little common sense. You don't have to swear eternal fealty to Al Gore to accept that compact fluorescent bulbs are worthwhile because they cost less over time. You don't have to be a raving enviromaniac to know that landfills are icky -- so recycle whatever you can and slow the landfills' growth. Don't water your lawn when it's raining. And always, always make faces from the window of your train at every passing SUV. Today's Heads or Tails presents a creative dilemma. Our Fearless Leader, Barb, has asked us to write about "tune." But, arguably, that has been the subject of my last two posts. Yesterday, I wrote about avoiding the news on weekends -- in other words... tuning out. Friday, I posted a video of the tune "It Ain't the Meat, It's the Motion." Anyway, back to the subject at hand... "tune"... having inadvertently done two recent posts arguably within the ambit of this morning's topic, how can I come up with something reasonably close to the assigned topic and not tread down either well-worn path? With Older Daughter soon to be wed (we're under five weeks now) and with Older Daughter and three other nocturnals (i.e., teens and/or post-teens) in residence at the Curmudgeon Family Compound this summer, it is imperative that we keep the family van in operating condition. Indeed, it is vital that we keep both of our remaining vehicles gassed up and ready to go at a moment's notice, that being about what a nocturnal gives us before taking one of said vehicles for one of their many purposes. The one constant of middle class American family life in the early 21st Century is that, no matter how many cars are 'in the family' at any one time, Dad can't have the use of any. But I digress. I started talking about the family van because it recently became apparent that said vehicle was not in pristine condition. While we haven't had much of it so far this spring, we have had some warm days... and on those warm days it became unpleasantly apparent that the van's air conditioning had ceased and desisted. Wimp! you call me... and again, wimp!... and I must stand, head bowed, before you and accept the abuse and opprobrium that you rightly heap on my head. Who needs to have a vehicle air conditioned? What about the 2-40 AC that we all grew up with (two open windows and 40 mph)? I entertained fond hopes, when the complete and utter failure of the van's air conditioning was placed before me, that the oil change place might be able to recharge the coolant and solve the problem. But alas. All the nice people at the oil change place could do was confirm my deepest, darkest suspicions, namely, that there was a leak in the system and that it would have to be taken in for repairs. The first obstacle to be overcome in taking the van in for repairs was finding a dealer to repair it. The place where we bought the van -- in the neighborhood -- was no longer selling new cars. It apparently had jumped, or was pushed, before Chrysler pulled the plug on so many others. It's service department had been disbanded and, although a successor had allegedly been reconstituted, I was thinking that I might... should... possibly... get swindled less by, er, get a better deal from a dealer hoping to someday sell me a successor van. To make this long story short... we found such a dealer... relatively nearby (but not within walking distance as the old dealer had been)... and $2,000 later the air conditioner works. And the van has new brakes. And it also has a new light on the dashboard going off for no apparent reason... other than to induce me to take the van back for additional, and still more costly, service. I remember when even an uncoordinated lawyer such as myself could tune up his own vehicle. Of course, when we changed the oil we poured it straight down the sewer... and this was probably, in hindsight, not the best plan. But now even the most mechanically inclined among us are entirely in the thrall of auto service departments and their infernal diagnostic computers. Taking a break from the news or avoiding reality? During the week I make it a point to keep up to date on the news. I read a newspaper on the train; I have another delivered at home. During the day I frequently go online to check both traditional (i.e., "dead tree") news sites and news blogs. At night, as I've mentioned, I watch newscasts on at least two different TV channels. I try to keep informed. The last couple of weekends, though, I haven't read much of anything in the paper or online other than the comics. My wife found a baseball trivia article in Parade Magazine yesterday, and she quizzed me on it, and I read a column or two, but no more than that. It has not been an intentional boycott. But I've begun to feel close to information overload by the end of the week, and I seem to be reacting instinctively. I find myself catching up on Monday mornings to all the disasters of the preceding weekend. It seems that mayhem, violence and destruction, war, famine and pestilence are all perfectly capable of proceeding without my monitoring them. I'm beginning to wonder if I should let all these unhappy events swirl on without me. Can a responsible modern person 'take a break' from the news -- or is this an unhealthy effort to further avoid reality? What do you think? Do you ever purposely avoid the news? In a comment to Tuesday's post, Barb picked up on a passing remark that I'd made, asking whether I'd made up the song title, "It Ain't the Meat, It's the Motion." No, I didn't. Exhibit A for the defense is at the top of this post. I listened to the Maria Muldaur (of "Midnight at the Oasis" fame) version online before posting this one; there was no video of her cover available. Do you follow the thermometer... or the calendar? I know it's June and, according to the Revelation of St. Albert Gore, we should all be sweltering in Chicago by this time. But it's been downright chilly here, actually, since a warm rain on Monday afternoon. Long Suffering Spouse and I are closing windows and putting on sweaters or jackets because it's cold. The kids are opening windows and turning on fans because it's June. I don't always make it upstairs when I come home from work until I actually retire for the evening. Tuesday night, though, I struggled over to the stairs to take something up -- and I about froze to death halfway up. Youngest Son had the window fan running at high speed in his room. We're talking wind chill here, folks. I took my life in my hands and entered the boy's room. I turned the fan off and pulled it out of the window. The hard part was finding a place to put it in the debris field. But I got the window closed. I didn't press my luck by trying to close the windows in Middle Son's room. At least his fan wasn't on. I closed his door, though, to try and contain the chill. I don't think it's just us, either: Last night was the award ceremony for the sophomore baseball team at Youngest Son's high school. Some of the kids wore sweatshirts, yes, but nearly all were wearing shorts. So my questions: Is this really a generational thing? Are you following the thermometer... or the calendar? Practical superconductor as near as the shower? Scientists seeking a superconductor that works at room temperatures should perhaps refocus their search on bathrooms used by teens and post-teens. Now that I have several nocturnals under my roof for the Summer, I've noticed a distinct absence of traction when attempting to enter the shower in the morning: The floor of the bathtub seems to be a true frictionless surface. I have to tell you: Nothing wakes me up quite so fast in the morning as being unable to find my footing in the tub. 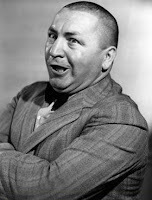 On the positive side, I now do a mean imitation of Curly Howard every morning -- woo woo, woo-woo-woo! My hypothesis is that the lotions and potions used by the nocturnals are responsible for this phenomenon. There is now a bottle of something in my bathroom called "body wash." This liquid serves a function similar to soap, apparently. I think this substance is used by Middle Son because I've seen this product advertised as providing 'maintenance for your man suit.' I think I can figure out what a 'man suit' is; I have been so far unable to ascertain why actual soap is inadequate to my son's needs. I don't know if this is the only substance responsible for the slippery surface in the tub. There are also multiple shampoos and creme rinses and body rinses that my daughters have installed in the shower area. It may be that it is a combination of these liquids, deposited over the course of the day, that results in the phenomenon I'm now experiencing in the mornings. If reputable scientists will not explore this issue, I will volunteer to accept a substantial government grant to investigate this matter further. Well, if this is HoT 93, then I've missed three Heads or Tails in a row. I hope Barb will forgive me. In the meantime, I suppose, the pressure should be on to come up with something really good. Unfortunately, the pressure is also on for me to get some work done. A motion in a court case is a request by a party to have the court do something: set the case for trial, dismiss the case, order compliance with discovery, sever the head of the worthless attorney for the other side and raise it high up on a pike in the courthouse square as a warning to others... that sort of thing. I have no idea why such requests are called motions, except that, in them, we "move" for particular relief. There is a rather ritualistic formula that is observed in stating a motion, at least here in Illinois. A party moves "this honorable court by and through its attorneys." When you think of it, that might be disgusting -- why would the court want to deal with something that's been moved through the attorneys? At the end of the motion, we "pray" for particular relief. This is not a violation of the separation of Church and State -- although, in filing certain motions, I will admit to directing prayers in Directions other than at the bench. Motions are ruled on. They are granted or sustained -- or denied or overruled. This, by the way, is how lawyers tell good judges from bad ones. Good judges grant our motions; bad ones deny our motions. We can be very shallow, fickle people sometimes. But that will be our little secret, OK? Long Suffering Spouse and I went to a 25th anniversary party a couple of weeks back. Older Daughter was already born by the time this couple wed. Long Suffering Spouse was reluctant to leave a three-month old child with a sitter for the Mass and the reception both, so we brought Older Daughter to church with us. At three months of age, babies are fully portable. Young parents who groan under the weight of diaper bags and bottles and changes of clothes may wonder at this statement, but it's true: At three months the child does not know, or care, where he or she is. A few months later and the child will recognize its usual surroundings... and loudly insist upon them, especially at naptime. Anyway, at three months, Older Daughter had not yet begun to vocalize. Long Suffering Spouse, then as now, reads up on all things related to development and health and she was becoming... not yet concerned... but increasingly aware that Older Daughter was still silent. Until, as it happens, our friends' wedding Mass. The bride's uncle was the celebrant and, as any doting uncle might, he gave a long sermon filled with family reminiscences as well as advice. Suddenly, the tumblers clicked into place for Older Daughter: She found her voice. Blah! blah! blah! she said, pretty distinctly and, as I recollect, quite loudly. I'm sure it didn't happen this way, but I seem to recall all eyes in the church swiveling in our direction. Surely some heads must have turned because Older Daughter, clearly pleased with her new accomplishment, continued: Blah! blah! blah! The thing is, she hasn't stopped. A quarter century later, and soon to be a bride herself, Older Daughter is as chatty as ever. She's at home with us now, and will be increasingly with us in the weeks leading up to the wedding in July. She had a bachelorette party Saturday night and the house was blissfully silent while she was away. But yesterday, though, Older Daughter was at home, and though she claimed to have gotten only a couple hours sleep, she did not nap. She talked, and talked and talked. She gave us a play-by-play account of who said what to whom at her party. She narrated a slide show on her computer, showing picture after picture to no one in particular. Our other children aren't nearly as loquacious. By comparison, they're all Calvin Coolidges to her Bill Clinton. Middle Son, who hasn't had a great deal of contact with his sister in recent years, between his own collegiate stint and his baseball games, finally interrupted her yesterday afternoon. "You know," he said, "you talk a lot." It didn't slow her down. Long Suffering Spouse tells me its Older Daughter's way of coping with wedding nerves. But we have six weeks to go! A milestone on the road to overnight sensation? Whenever a person, place or thing penetrates the public consciousness it is considered, in some sense, an overnight sensation. Much as I might hope and dream otherwise, though, big success actually comes in little increments. These increments may build like bricks and create a solid career -- like little cases may, eventually, build a solid law practice. Or the little incremental successes may sometimes build up to a critical mass and suddenly explode. 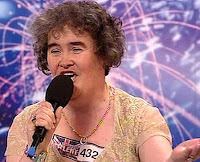 I'm quite certain, for example, that Susan Boyle sang quite beautifully long before she was seen on "Britain's Got Talent" -- and became an 'overnight sensation' on YouTube. There must have been many fits and starts along the way to that breakout moment. Today, possibly, I have a new little incremental success of my own: An Internet entrepreneur named Jay Harrison, who is running a site called BoomSpeak wrote recently and asked if he could reprint some of my old essays on his site... with attribution and a link and, of course, no money whatsoever. I said 'yes' -- even after he confessed he would have to edit some of them to fit a 400-word target space. Four hundred words for a lawyer is barely enough to get past the introduction... so I'm curious to see what he can do. The first of what may be several essays culled from Second Effort appears today on the BoomSpeak essays page.